This is another Custom RV case of adapting our chosen RV to more fit our lifestyle. Our fifth wheel came equipped with a large pantry next to the refrigerator that is quite large with many adjustable shelves. The problem with it was that it is 8" wide and 24"deep and when you stocked the shelves you couldn't see what you had, so you unload the first 1/2 of each shelf lookin' for something. I have seen the slide out metal rack with the hanging baskets in some newer RV's and looked into that option. At the time I was still working and since I dealt with several wholesale cabinet supply companies everyday, I researched this rack. I found the cost outrageous, the rack alone was close to $200, and then you had to purchase baskets at additional cost. I see Rev-A-Shelf has several sizes listed on their website ranging from $865 - $944 in price. Well I decided to design and since I'm a 'Wood Butcher Extraordinaire', build with what I know best, 'Wood'. Since this would be visible when the pantry door was opened I chose 1/2" oak plywood for the job. First I constructed a rectangular box 5" wide by 211/2" long by 15/8" high, to mount my drawer slides on. Then I constructed another rectangular box 7" wide by 22" long by 25/16" high, to fit over the smaller box and house the other half of the drawer slides. This enabled me to completely conceal the drawer slides. I used 150 pound capacity drawer slides so I was sure to have adequate strength to carry whatever we loaded up the pantry with. I figured 22" as a finished depth to allow room in the rear so nothing rubbed the wall and allowed room at the front for a cabinet pull to open the siding rack with. I lost a little space compared to the original shelves in the cabinet, but more than made up for it in versatility. pieces for my shelf clips to attach to. The building of the shelves came next and it took a little experimentation to determine how much space to leave between components so the shelves were adjustable as well as removable. The shelf bottoms were 221/4" long by 6" wide and the sides 201/4" long by 3" high, fastened on the sides of the shelf bottoms so no end grain showed, forming sort of a trough. After mounting the big pantry box on the box which concealed the slides I realized it needed some directional stability at the top when it slid out and in. I added a third drawer slide turned flat to the top of the big pantry box and a piece of wood in the top of the pantry itself to mount the other half of the slide to. That solved the problem of the pantry wobble side to side as it slid out and in. At this time I discoverd that the opening is not square, go figure. Some adjustments to the slide position and, voila, the new pantry slides in and out, doesn't hit or rub on anything. Next I installed a handle type cabinet pull in solid brass that I found on clearance at a local big box store and a bunk or door type slide bolt at the bottom to prevent the pantry from slidin' out as we're travelin' down the road. Now comes the part where I fill up the shelves and everything goes catty-whompuss, rub, hang-up, scrape all that nice polyurethane off, "Oh thank you for lookin' down on me Mr. Murphy". It didn't happen, Murphy must have been harrasin' someone else at that moment cause everything worked just as it was supposed to. The real test came on the road. Travelin' down the not so smooth pavements of our wonderful highway system carryin' Lord knows how much weight in canned goods in our new sliding pantry. Well I'm happy to report that after 15,000 miles of towing on and off road we've had only an occasional problem with a shelf jumping up, disengaging it's shelf clip, causing the shelf to drop crooked in the pantry. Makes for some interestin' times when you stop and find you can't get your pantry open. I'm thinkin' on a solution to eliminate this problem even though it has only happened twice. I think I'll drill a hole in each shelf clip and insert a screw to hold it from jumpin' out, unless I can come up with somethin' easier. Very nice is my first words. Super great looking and now you have gave me more hopes for my project 5th wheel RV. 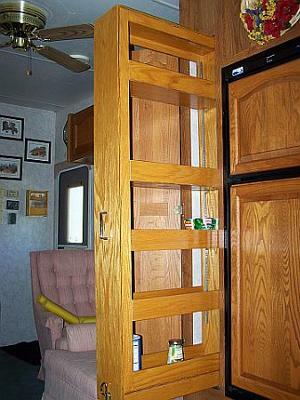 As most RVs, they may come with many cabnets but not a useable pantry. Mine fits this statement well. Have a pantry, but can not use it like we would like to. I have to get out my tablet, get the wife and start making plans for another new project. Have a 2001 35 foot 5er with 3 slideouts. Lots of room, but not where we need it. Very nice work. You did right, by making your own pull out pantry. My rig did come with the wire pull out shelves. Fully loaded, they would hold a pathetically small amount of food. I decided to remove the rack and shelves and build my own. I was amazed at how heavy the rack system was! And when I removed it, I realized it was much shorter in depth than what the cabinet allowed, wasting precious cargo space. So I built in shelves, and like you them to be wanting in easy access. Then I built sliding shelves which gave easy access. But I like your design much better, as it looks like it would hold more. My individual shelves have a glide on the bottom, and cannot hold the amount of weight that yours can. May have to go back and redo mine. Thanks for sharing. One of those projects you don't do until you fight with it a few times (and hear the objections from the Mrs.) Seems like the manufacturers would have thought of this, but those extra drawer rollers would have tacked $20 onto the bottom line! Looks great! I plan to do the same to our 'Home on Wheels'. Keep up the great work and creative ideas. I give you an extra star... 'cause you did the work yourself... I figure the splinters and busted thumbs deserve the ink. :-) Geeze... That looks shiny to me! Like I said... there's a lot of you guys make my efforts seem pretty weak... Nice piece of work!